My current workflow focuses on future-proofing my photos so that I can take advantage of any new software that comes along. I do not want to be dependent upon any piece of software to work with my photos, so I stick to formats like JPG and Canon’s raw. This post covers how I get the images onto my computer and begin the editing process. I currently use Apple Macintosh computers with Adobe Lightroom but it wasn’t to long ago that I used Windows XP, ACDSee, and Photoshop for the same results. NOTE: Instead of creating a “My Pictures” directory you can use the directory created by your computer such as “Pictures” on Mac and “My Pictures” on Windows, I prefer to keep this folder on an external hard drive or Storage Area Network device so create my own “My Pictures” directory. I also create a “Not My Pictures” directory where I store images that I get from other sources. Create a “My Pictures” directory; inside that directory create an “import” directory and an “export” directory. Now get out there and take some photos. I never plug a camera into my computer to transfer images. Use a quality memory card reader, not a no-name generic one, but one from Lexar, Sandisk, or other major memory manufacturer. If you have a card reader built into your computer you are all set. Plug the memory card reader into the computer first, then the memory card into the reader. Put the memory card into the card reader and wait for it to appear then go to the directory on the memory card that contains your photos. Now open a second window and navigate to the “import” directory that you created earlier. Then create a new directory named with the date and a short description of the event. Use the format of 4 digit year, 2 digit month, and 2 digit day so that the folders will sort correctly and be very easy to find. For the description I use one or two words trying to keep the name short but easy to understand, it only needs to be enough information to jog your memory. For example, Christmas family photos would go under “20101225-christmas-family”. But the word “family” is unnecessary if those are the only photos you took that day. Now copy all of the photos from the memory card to the folder you have just created. Once the copy is complete eject the memory card from the reader. On a Mac it is very important that you do this first from the operating system before removing the card, I have permanently damaged a card by pulling it out of the reader before the computer was done with it. Do not delete files or format memory cards using your computer, let the camera do all of that to keep your cards in good shape. I format my memory cards in the camera only after I have finished processing them, that way I have a quick backup if something goes wrong while I am working on them. It would be even smarter to make two copies of the photos when I move them to my computer on separate hard drives. Now I fire up Lightroom and import all of the photos using my default meta data and add keywords that are applicable to them all. I am not covering meta information in this post, but cannot stress enough how important it is to properly tag your images with keywords, descriptions, locations, and anything else that would make it easier to find in the future. Once in Lightroom I use the “Library > Rename Photo” to rename all the photos with the format of “dave-nelson-Date (YYYYMMDD)-HourMinuteSecond-Sequence # (0001)” which will result in filenames like “dave-nelson-20101225-191521-0001.jpg” which guarantees a unique filename even when I am shooting 6 frames a second. It may look like a ridiculously long filename, but it makes it really easy to see who took the photo and when it was taken. Now that everything is set-up it is realy simple to import and rename new photos. The next step is going through the photos and flagging them as “selects” and “rejects”, adding keywords and descriptions, color correcting, rotating, cropping, and exporting. Cooking has never been interesting to me, after reading this book I am still not very interested, but I do want to learn how to cook well enough to feed my family a nice balanced meal. I read this book using Safari Books Online an iPad, a MacBook, and an iPhone. Reading using HTML view in mobile Safari works ok, it is not as good an experience as a proper eBook that is correctly formatted, but it is a lot better than trying to read a PDF that is formatted with all the wasted space of a print book. Cooking for Geeks approaches cooking from a scientific and computer geek point of view. I enjoyed the information about what makes food taste the way it does, why we like the taste, how to bring out the best taste, how our taste buds work, and some of the basic recipes to get me started cooking. I used the information in the book to buy kitchen tools like a non-stick frying pan, an iron skillet, probe and oven thermometers, and a kitchen scale. I look forward to using them to cook my family some great meals. One of my favorite features of this book are the vignettes from celebrity chefs, celebrity geeks, and food scientists. From Adam Savage talking about cooking eggs to Jeff Varasano of Atlanta’s Varasano’s Pizzeria hacking his home oven to get temperatures hot enough to cook a proper pizza they were all great. More than just a cookbook, Cooking for Geeks applies your curiosity to discovery, inspiration, and invention in the kitchen. Why is medium-rare steak so popular? Why do we bake some things at 350° F/175° C and others at 375° F/190° C? And how quickly does a pizza cook if we overclock an oven to 1,000° F/540° C? Author and cooking geek Jeff Potter provides the answers and offers a unique take on recipes — from the sweet (a “mean” chocolate chip cookie) to the savory (duck confit sugo). I rate this book an 8 out of 10. I highly recommend this book to any geek that has an interest in cooking. It is not the only book needed to go from a non-cook to a great cook but I think it is a great first step. My next cooking book is Alton Brown’s “I’m Just Here for the Food: Version 2.0” or “How to Cook Everything” by Mark Bittman from which I hope to learn basic kitchen skills. I am currently in the process of reading How to Cook Everything by Mark Bittman and am really enjoying it. Bobbie has already used three of the recepies to make meatloaf and a coconut cake. The more I read about cooking from different chefs the more I hear about this book. It sounds like every chef has this book and has used it extensively. The book is broken into different types of food and each section begins with great information and tips about that type of food and how to prepare it. I feel like I am learning a lot from this book and hope to put it to good use. 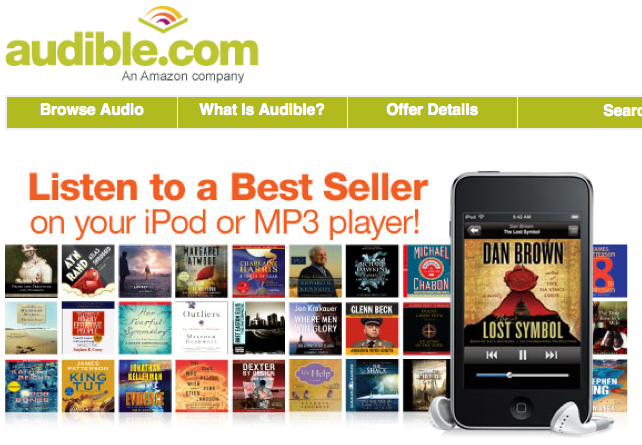 Ten months ago I purchased an Audible.com AudibleListener® Platinum Annual Membership which gave me 24 “credits” to buy audio books with. All of the books I purchased were only one credit but there are books that cost more. Buying 24 credits at once lowered the cost to under $10 a book, which is a great deal when most audiobooks are $25 or more. The subscription is meant to last a year, but I used all my credits in 10 months. I could buy another 24 credits right now but have decided to listen to podcasts for a little while. I downloaded the “Enhanced” format for most books and imported them into iTunes then listened to them using my iPhone. This worked really great for me as my car has an auxiliary jack that I am able to use to play audio directly from the iPhone through the car stereo system. The enhanced format is such a high quality that I am able to hear the edit points in the audio of many of the books. The only really big problem I have when listening to audio books is not an issue with Audible but the TERRIBLE iPod interface on the iPhone. The next and previous chapter buttons are really close to the play/pause button and I regularly click them by accident, which is horrible when on a motorcycle, driving in traffic, or working in the garage. Recovering from jumping a chapter or two forward in a book is a real pain that can spoil a twist in the story. Since January 2009 I have listened to 59 different books from Audible, they have ranged from terrible to incredible and my wishlist always has more books waiting for me to purchase and listen to. Over the past year I have to say that the Dresden Files by Jim Butcher and narrated by James Marsters have been my favorite books. James Marsters is an incredible actor that brings every character to life and draws me into the books in a way that reading print would not. The next best book was Storming Las Vegas by John Huddy and narrated by Stefan Rudnicki. It is a great account of armored car robberies in Las Vegas. If you like audiobooks, have a long commute, like to jog/walk/exercise, or would like to read books in the dark I highly recommend Audible.com as a source of great audiobooks.